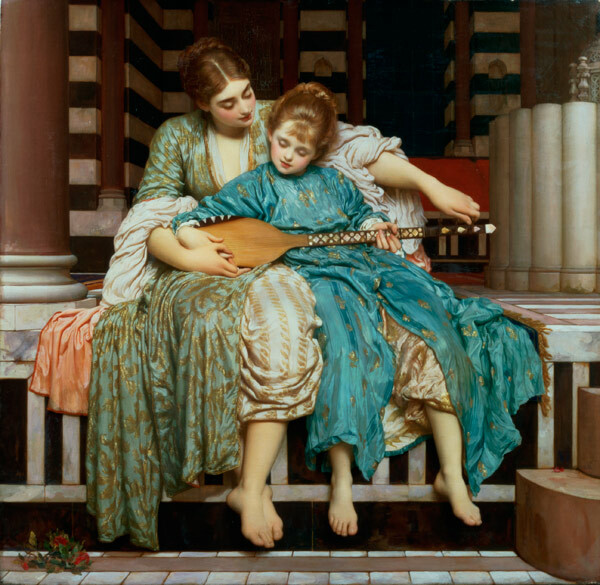 Interpretation: An older woman helps a girl to play a guitar, possibly of Syrian origin. Leighton developed a deep interest in Eastern art and architecture after his first trip to Algeria in 1857, and here we can see him introducing this into his art. The two figures are surrounded by and dressed in souvenirs from Damascus. The architectural setting for the painting shares an affinity with George Aitchinson's contemporary designs for the Arab Hall at Leighton House, although it has also been linked with the sixteenth century mosque of Suleiman Pasha at Damascus.